Dimensions: m 56 x 14 x h 3. In January 2001 the oil tanker, ‘Jessica’ ran aground on a sand bank in the Galapagos archipelago, spilling the petroleum from it large tanks into the sea. For the Galapagos, which has been a national park since 1936 and has been on Unesco’s World Heritage List since 1978, this was a ecological disaster without precedent and extremely dangerous for the rare species of plants and animals that populate the area. This disaster is also part of an infinite series of environmental catastrophes that have destroyed entire ecosystems, profoundly affecting the life of this planet. 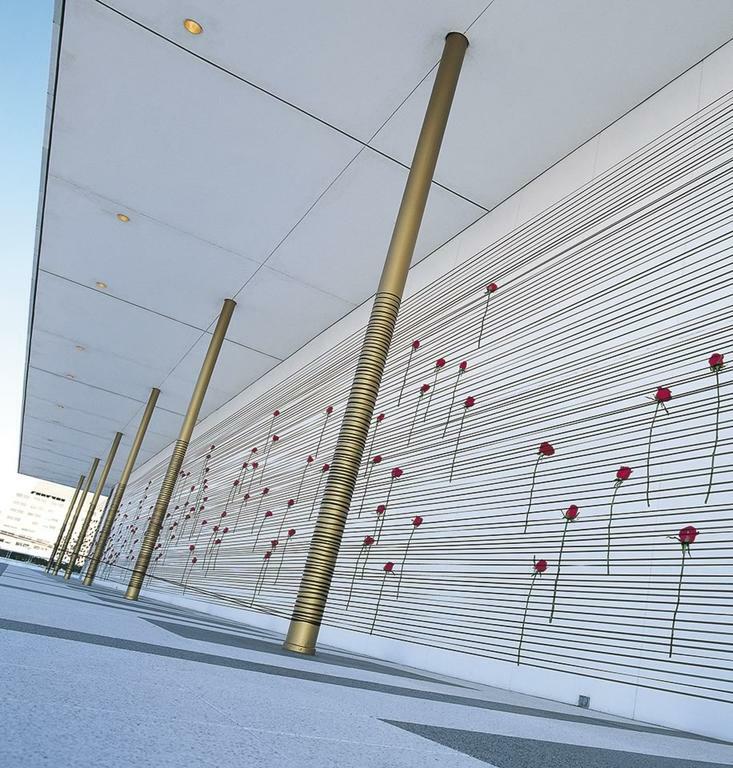 The theme ‘Connecting Worlds’, with which the curators of the Kennedy Center wanted to inaugurate this exhibition dedicated to sculpture, suggested to Maria Dompè an opportunity to reflect on the safeguarding of the environment. ‘Giving a flower,’ writes the artist, ‘ can become the beginning of a new culture’. Maria Dompè interweaved flowers into this suggestive installation. 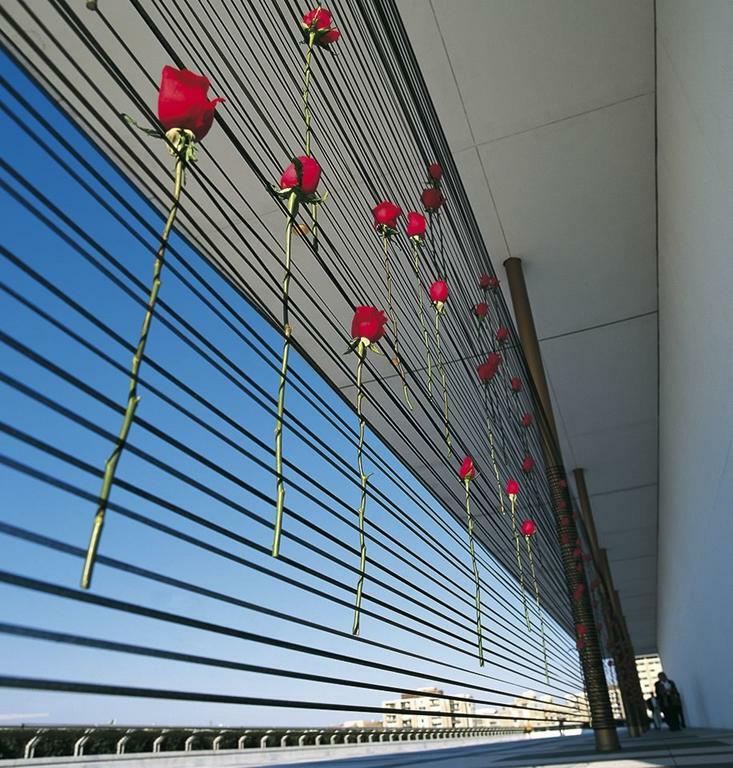 On the terrace of the Kennedy Center, a windy and high space on the Potomac from which the view is of a vast horizon, the artist has separated the covered passage from the open space by subtly weaving bands of elastic in which roses can be inserted as a votive offering; the effect is a musical notation, an extended pentagram in which the roses play the part of notes; the woven bands continue from the base of the columns to the outer railing of the terrace, creating an oblique and vibrant net. 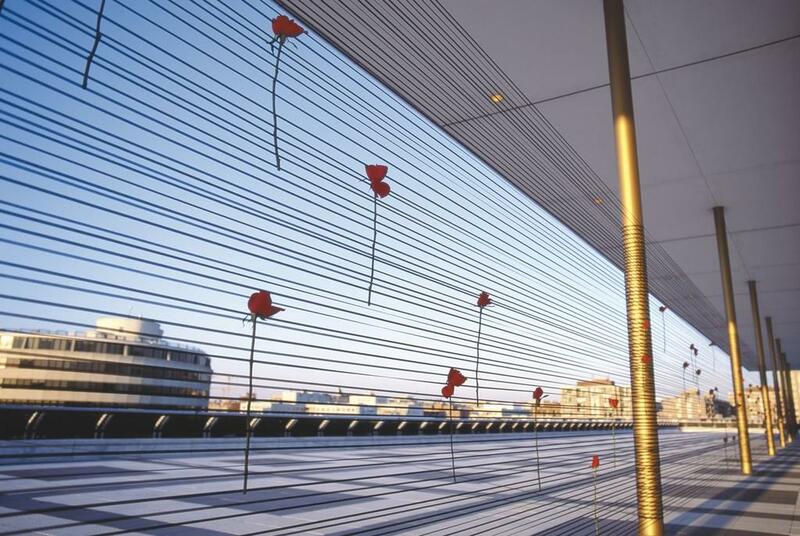 The lightness of this installation, animated by the vivacious red of the roses, creates a strong relationship with the immense panorama surrounding landscape, communicating a sense of unconfined space that creates an opening both to the outer world and to the inner human conscience.